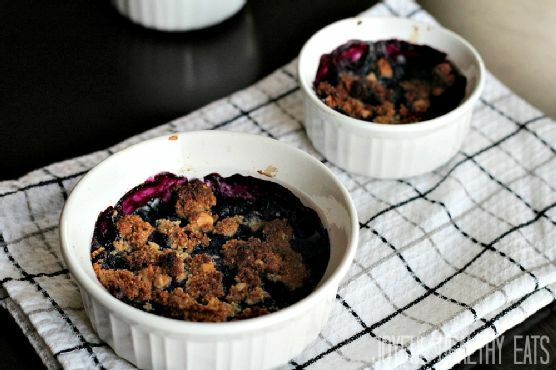 Preheat over to 375.Wash 2 pints of fresh blueberries and distribute evenly between 6 small ramekin dishes.Juice 1 lemon and evenly spread juice over each ramekin.Toss blueberries to coat with lemon juice.In a small bowl, mix together almond meal/flour, maple syrup, melted butter or coconut oil, salt, cinnamon, and chopped hazelnuts. Mix until everything is combined.Sprinkle each ramekin with a little bit of the crumble. Place in oven and bake for 30-40 minutes, until blueberry mixture starts to bubble and topping is browned. Cobbler on the menu? Try pairing with Cream Sherry, Moscato d'Asti, and Port. A common wine pairing rule is to make sure your wine is sweeter than your food. Delicate desserts go well with Moscato d'Asti, nutty desserts with cream sherry, and caramel or chocolate desserts pair well with port.